By providing good, old-fashioned customer service over the years, proprietor Joe Carcone has gained a loyal following in the community. Many hundreds of area residents have come to depend on him, and to rely on the technical expertise of his friendly staff to keep their family vehicles in peak running condition. The success of his neighbourhood business has been built on a foundation of customer satisfaction. 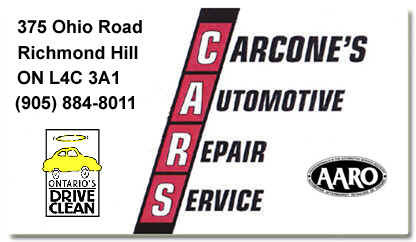 Indeed, satisfied existing clients are Joe Carcone's best advertising. Their 'word-of-mouth referrals' continue to be his largest source of new customers. Perhaps you yourself are visiting this web site on the recommendation of a friend or acquaintance. 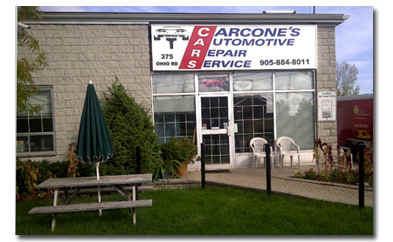 Whether a referral led you here or not, one thing is certain: You too can entrust all of your vehicle's service and repair needs to the team of automotive professionals at Carcone's Automotive Repair Service. Call Joe Carcone today and find out what good customer service is all about!